It’s widely reported that the Russians set up “troll farms” to spread fake news and misinformation to create discord and confusion in America. What’s not been reported is that pay-for-praise practitioners and profiteers right here in our domestic franchise industry have been getting away with that for years. Is Plano, TX-based BizCom Associates public relations firm one of them? BizCom Associates is headed by co-founders Scott White and Monica Feid, and BizCom Leadership Team includes Dr. John P. Hayes, Melissa Rubin, Morgan Butler, Cortney Haygood, and Ashley Mungiguerra. BizCom Associates franchise clients (present or former) include FASTSIGNS, Dwyer Group, Wingstop, Huddle House, Restoration1, Edible Arrangements, Gigi’s Cupcakes, Pinot’s Palette, Burger 21, Discovery Point, Mr. Gatti’s Pizza, Smoothie Factory, Pei Wei Asian Diner, Red Mango Yogurt, Twin Peaks, Corner Bakery, Fitness Together, & Homevestors. 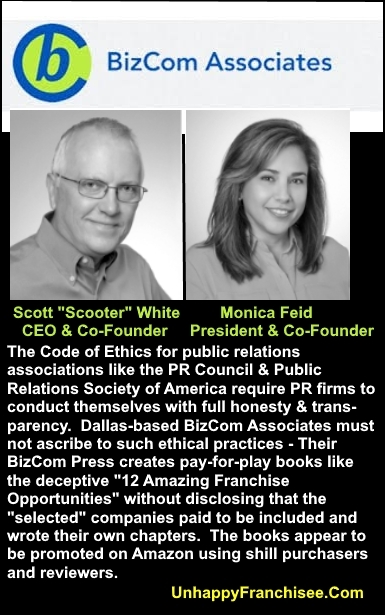 Plano, TX-based BizCom Associates may have been founded with the intention of being a legitimate public relations firm, but somewhere along the way Scott White and Monica Feid must have decided that creating and spreading their own fake news for clients unencumbered by business ethics was more profitable. The book chapters supposedly containing expert analyses about these companies were actually provided, from a fake third person point-of-view, by the franchise companies themselves. BizCom does not disclose that the endorsements were paid for and that the book author did not research nor write the core chapters of the book… either prior or after the book’s purchase. In case I have misunderstood BizCom Partners true intentions, I will lay out the evidence that has led me to believe the above scenario as true. I invite Scott White, Monica Feid, Dr. John Hayes or others on the BizCom payroll to clarify anything I have gotten wrong. I also invite other Public Relations professionals, including associations PRSA, PR Council, and the International Franchise Association to comment on whether Dr. Hayes’ and BizCom’s pay-for-praise program meets their organizations’ ethical standards. As of this writing, the BizCom promotional website AmazingFranchises.Com still displays the “12 Amazing Franchise Opportunities” flyer that the BizCom used to promote the sale of Dr. John Haye’s endorsement and inclusion in the book to franchisors desperate for credibility they obviously lacked. The cost to include a chapter about your franchise opportunity in Amazing Franchise Opportunities (2018) is only $5,000. The book will be published in both e-Book (automatically downloadable) and paperback formats. For the $5000 fee, franchisors were also promised exposure in the book’-based PR campaign, a custom cover and downloadable ebook they can post on their website and use as a marketing tool, and five paperback copies with more available at a discounted price reserved for Amazing franchisors. Not only did BizCom Associates offer their established (and new) clients the opportunity to be named an amazing franchise by industry expert Dr. John Hayes, they also gave the franchise sellers the opportunity to write their own glowing analysis of the franchise investment they are peddling. The franchise-seller-supplied promotional chapter were to be provided in the third person, as if written by a third-party, like, say, the book’s author. If your story meets our criteria as an Amazing Franchise Opportunity, you will provide us with a 2,000 – 2,500 word article about your business along with up to three high-quality photographs and your company logo. We’ll give you guidelines for preparing the article, or for an additional fee we can write the chapter for you. Dr. Hayes will also write the book’s Foreword to emphasize why you and the other franchisors included in the book represent Amazing Opportunities. The chapter introductions that Dr. Hayes supposedly wrote almost invariably contain duplicate copy culled from the main chapter… supplied by the amazing companies. There was no disclosure that the book was a paid endorsement of 12 credibility-starved franchise sellers, nor that the book was, in essence, a collection of paid advertorials dressed up as legitimate investment analysis. Publisher and publicist BizCom represented that “12 Amazing Franchise Opportunities – Second Edition” was the result of the objective research and analysis into 3,000 franchise opportunities, and selection, by an internationally respected expert, of a short list of the most “amazing” 12 opportunities available. “[Dr. John Hayes] masterfully compiles and presents a cadre of concepts destined for greatness, providing readers with a qualified funnel from over 3,000 franchise concepts down to 12 that are worthy of consideration,” writes Dr. Benjamin C. Litalien, CFE, founder and president of FranchiseWell, in the book’s Foreword. Amazon Guidelines prohibit authors and publishers from reviewing their own books or having friends, family, employees, associates etc. from making straw purchases and leaving shill reviews. Dr. Hayes & BizCom not only flout these rules, they encourage their clients to do so also. BizCom and Dr. John Hayes’ have shared their secrets system for artificially manipulating the Amazon system to get “best-seller” status – without even having to sell a single book honestly and legitimately! In John Hayes’ internal coaching materials (obtained by UnhappyFranchisee.Com) for the first edition of the book, he explains that there is an initial “review” stage when the book is first posted with a review price of .99. Ask your sales team, your admin team, your support team, family, friends, franchisees, etc. to review the book…. Get people to buy the book and review it. It is against Amazon’s policy to pay people to review the book, but we can ask (I often beg!) people to buy and review the book. 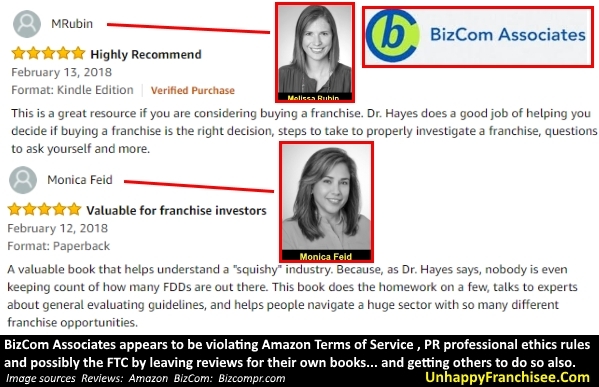 Dr. John Hayes directs franchisors to use shill purchasers and shill reviewers during the review, free-giveaway and sales stages to inflate both the sales ranking of his books and to create bogus positive reviews that will add credibility to both his publications and, supposedly, the franchise opportunities. BizCom has become so brazen with their deceptive practices, President Monica Feid and BizCom employee Jennifer Rubin left shill reviews with their own names. A valuable book that helps understand a “squishy” industry. Because, as Dr. Hayes says, nobody is even keeping count of how many FDDs are out there. This book does the homework on a few, talks to experts about general evaluating guidelines, and helps people navigate a huge sector with so many different franchise opportunities. A “squishy industry”? If that strikes you as an odd turn of phrase, it also appears on page 169 of the supposedly Hayes-written book (“It’s a Squishy Industry”) and again on p. 170 (“Are you getting the idea that franchising is a squishy industry?”). This is a great resource if you are considering buying a franchise. Dr. Hayes does a good job of helping you decide if buying a franchise is the right decision, steps to take to properly investigate a franchise, questions to ask yourself and more. As usual, neither Feid nor Rubin disclosed their relationship, letting prospective book readers and/or franchise purchasers mistake them for honest persons expressing genuine, trustworthy opinions. We published our findings as part of this series, and solicited input, corrections, clarifications, and explanations from Dr. John Hayes and the participants. In just a matter of weeks after its release, the second edition of “12 Amazing Franchise Opportunities” by our own Dr. John Hayes and produced by BizCom division BizComPress hit #1 in Amazon’s Small Business Franchise category and on several occasions since has ranked among the Top 10 in that category. Yes, “a peek behind the curtain” is an apt, if accidental, reference to the con-man in the Wizard of Oz. First, we use a variety of means to contact as many franchise companies as possible, whether by e-mail, at trade shows and industry events, through our industry contacts and other means. All are invited to send us a letter explaining why their franchise opportunity is amazing and, for a promotional fee, include their amazing story in the book. Dr. Hayes then interviews the company executives about the amazing attributes of their business and writes his own introduction to each of the opportunities. Dr. Hayes’ supposedly original intros to the chapters are mostly rehashed and even duplicated text lifted from the company-furnished chapters they precede. And they are not “inserted throughout the book,” they are the core chapters of the book, from page 26 – page 49. The generic chapters (as BizCom has described them) on the “squishy” topic of franchising are lumped, appendix-like, at the end of the book – following the “12 Amazing Franchise” chapters for which the book is named. The BizCom blog post response shows that these folks have gone so far down the rabbit hole, they can’t break out of their Pollyanna Snake Oil Sales patter. One of the questions we sent to Dr. John Hayes was whether he truly believed these were sound franchise opportunities and among the best investments available. We certainly consider them amazing! And for many good reasons! But would they still be just as amazing if they were not willing to pay $5,000? And what of the representation that John Hayes provided a “qualified funnel” to help narrow 3,000 franchise investments to 12 that are among the best? Are they the “best” franchise opportunities? Really? Does that mean that Dr. Hayes believes there are no “amazing” franchise opportunities because everyone is different? A particular franchise could be amazingly tragic and the cause of financial devastation to one person… and the same franchise could be an amazing windfall – representing $5,000 for publishing a pre-written chapter – to a second person… especially the second person was in the business of spreading fake news and misleading consumers about the most important investment decision of their lives. What do you think? Are BizCom Associates’ business practices within the ethical guidelines for public relations professionals? ARE YOU FAMILIAR WITH DR. JOHN HAYES, SCOTT WHITE, MONICA FEID, MELISSA RUBIN & BIZCOM PUBLISHING? Once again a great piece. Unhappyfranchisee. Com is single handedly taking on what seems to be a corrupted franchise world in an attempt to clean it up. There are some good franchisor out there but unfortunately there seems to be more bad than good right now. Thank you for the courage to challenge this. This is only the tip of the iceberg to the tactics used not only to gain new franchisees but in many situations to fleece franchisees once they have bought into an organization. The stories and the tactics used too most who haven’t experienced it don’t seem possible. But I can tell you I have seen tactics that you can call nothing short of criminal. Yep, and it will only get worse as Trump’s inept and uncaring about us innocents administration continues to remove any regulations over greedy, shady businesses, allowing them to pursue any scam that they care to foist on us. Your “unhappyfranchisee” service has come along at the apropriate time. Bizcon has breached so many ethical standards that it’s hard to know where to begin. First, as members of the Public Relations Society of America, they are obliged to live up to the society’s code of ethics. https://www.prsa.org/ethics/code-of-ethics/. That includes honesty. Bizcon has been dishonest by not disclosing that these so-called books are pay for play. That’s a clear and astonishing lapse of ethics. Second, the code of ethics requires PR agencies to work in the public interest. By not disclosing that they charge a fee to appear in these books–all to prey on unsuspecting investors–that is not in the public interest. Next, by gaming Amazon and operating in clear violations of their policies they are just as unethical and are engaged in the same unlawful practices as Cambridge Analytical, which similarly broached Facebook standards. Next, by perverting the assumed objectivity of publishing and journalism (and make no doubt John Hayes misuses the mantra of a journalist and regularly flaunts his journalism degrees) they are abusing the very institution their agency depends on for its livelihood. PR firms are not journalists and should not publish opaque media in an attempt to usurp journalistic goodwill and dupe the public. Next, by posting fake positive reviews of this so-called book, Monica Fiend and Melissa Rubin place their careers and their agency–as well as their own clients–at great risk of reputational impairment and industry sanction as well as FTC action. They should study what happened to the PR firm Reverb when it was discovered that their employees were posting fake reviews of client apps on Itunes. The actions of Monica and Melissa are not just some funny joke or cute promotional stunt or innocuous act…it’s illegal: https://www.nytimes.com/2010/08/27/technology/27ftc.html Thanks Unhappyfranchisee.com for exposing them and let’s hope something good comes from this in the way of real action from the government, from reputable franchise companies, from the industry itself as well as from other PR firms fed up with this kind of crap perpetrated by competitors. HONESTY We adhere to the highest standards of accuracy and truth in advancing the interests of those we represent and in communicating with the public. Core Principle Open communication fosters informed decision making in a democratic society. Front groups: A member implements “grass roots” campaigns or letter-writing campaigns to legislators on behalf of undisclosed interest groups. Lying by omission: A practitioner for a corporation knowingly fails to release financial information, giving a misleading impression of the corporation’s performance. A member discovers inaccurate information disseminated via a website or media kit and does not correct the information. Not sure Trump is to blame here as per the earlier poster, as this type of thing has been going on for a long time, but some people just can’t help playing the political finger pointing card. I actually Agree that Trump’s administration will only exacerbate the poor situation for Zees. Lack of Regulatory remedies only hurts the little guy. Trump has clearly indicated he doesn’t care for regulations in general, and the fact his administration has shown indifference to the plight of all Americans only emboldens unethical Zors to screw people harder for more profit. What’s the point of regulations if they’re not enforced and there’s no private right of action for Zees at the federal level? All these little guys jump into Franchising head first thinking it’s a regulated industry to only find out it’s the wild west, and they got screwed before they even know what happened to them. Trump are you kidding me? IFA has been around for over 50 years and we have had both republican and democrat presidents and for most of that time democrat controlled house and senate. So just stop it would you please. Next you will be blaming the pope. Tumps is all about rolling back regulations. But in franchising there are no regulations to roll back. If these slime balls were pumping and dumping stocks and defrauding investors with pay to play fake books and bogus online postings, they would all be locked up. In franchising, it’s all buyer beware which emboldens people like Hayes, Scott White, Monica Fiend and Melissa Rubin to do whatever it takes to help their franchise clients generate leads and sell bad deals. The entire scheme is only possible because the deals are so rotten that no one would ever buy them without the con taking place in the background. Hayes says as much in his video when he talks incessantly about a franchisor’s need for credibility. Never once, does he mention a franchisor’s need to generate a financial return for an investor. No…it’s all about the sizzle and not the steak. He’s so corrupt he doesn’t even know how ridiculous he sounds when he pumps these deals to both investors and the franchisors who fall for his fake book conspiracy–and make no doubt, this is a conspiracy to defraud investors! There are always the “Kool Aid” sippers offering their comments but others here who understand that, although “Cheaters and Scammers” have always been with us indeed but never before have we had such a blatant member of this greedy, slimy group leading from the WH! More’s the pity!